On 8 February 1964 North Yemen introduced its first series of banknotes. The issue consisted of just three denominations – 1, 5 and 10 rials. On the front of each note was the Yemeni coat of arms; while on the back is an interesting selection of images. The 1-rial note has on its back an illustration of buildings in Sana’a, the capital city of North Yemen. The buildings are constructed of mud bricks and decorated with white plaster and included in the scene is the minaret of the Musa Mosque. The illustration is copied from a photograph taken by the German adventurer Hans Helfritz. On the back of the 5-rial note is depicted the ‘Lion of Timna’. This ancient bronze statue of a cupid astride a lion is a wall decoration found in the ancient Qatabanian city of Timna in 1950 during an archaeological expedition led by Wendell Phillips. It is on the back of the 10-rial note that a real mystery occurs. The illustration is of a dam, apparently in a very large wadi in the desert (Figure 1). The dam is of a modern construction and no dam of this nature existed in Yemen in 1964 when the banknote was issued. So why was the modern dam with open sluice gates depicted on the 10-rial note? Speculation suggests the objective was to illustrate the Ma’rib Dam, one of the ancient engineering wonders of the world, which is found in Yemen. However, it appears the artists had no photograph or image of the dam on which to base an illustration. 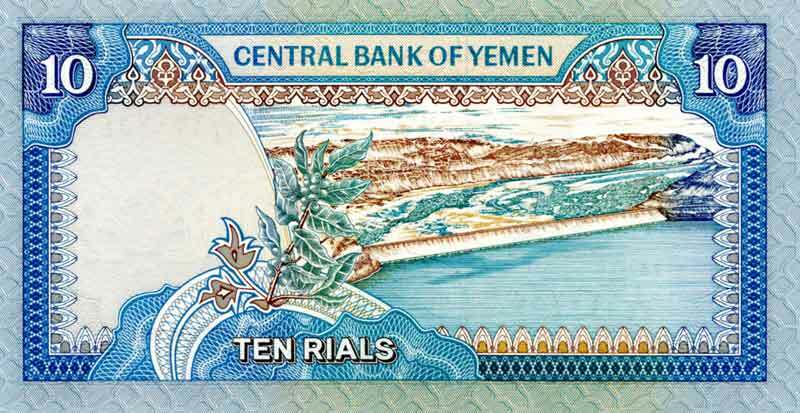 Figure 1 – The back of Yemen’s first 10-rial note, showing a very modern dam in a desert setting. If it is meant to represent the Ma’rib Dam, reality did not match the intent. The first dam at Ma’rib was built between 1750 and 1700 BC. The dam was 580 m long and four metres high, and built with packed earth. It ran between two groups of rocks on either side of the river and was linked to the rock with substantial stonework. The dam's position allowed for a spillway and sluices between the northern end of the dam and the cliffs to the west. Around 500 BC the height was increased to 7 metres, the upstream face of the dam was reinforced with a cover of stones, and irrigation was extended to include the southern side as well as the northern side. The dam fell under the control of the Himyarites around 115 BC. They created a structure 14 metres high with extensive water works at both the northern and southern ends – with five spillway channels, two masonry-reinforced sluices, a settling pond, and a 1000 metre canal to a distribution tank. These extensive works were not finalized until 325 AD, but when completed they allowed the irrigation of 25,000 acres (100 km²). Ultimately the dam fell into disrepair, evidently while warring factions made it impossible to repair the dam. The breach of the dam is famous in the annals of ancient history and reference to the breach is to be found in the Holy Quran. The ruins of the dam are today a tourist attraction, with sections of long stone walls and structures for the sluice gates still very impressive. Upstream from the dam are vast amounts of silt and sand which have washed down over the millennia. Figure 2 shows part of the modest remains of the dam wall at Ma’rib, showing how simple the dam is by modern standards. Figure 2 – Tourists atop a section of the ancient wall of the Ma’rib Dam. In the foreground, to the left and right of the image, are the remains of the structure which held a sluice gate. The unusually modern Ma’rib Dam reappeared on the 10-rial note of the second series of notes issued in Yemen, but there has been no effort to properly depict the ancient dam on the banknotes of Yemen, which is peculiar considering the fame of the dam. 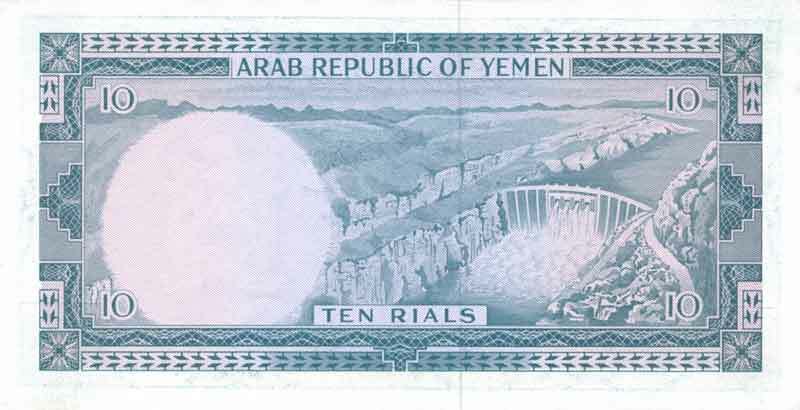 However, on 1 May 1990 the Central Bank of Yemen issued a 10-rial note (Figure 3) which depicts on its back the modern Ma’rib Dam (Figure 4). Completed in 1986, the modern dam was built with aid from Sheikh Zayid al-Nahayan of Abu Dhabi, whose ancestors lived in Wadi Nahayan near Ma’rib. Figure 3 – The back of the 10-rial note issued in 1990, showing the dammed lake and the dam wall of the modern Ma’rib dam. Figure 4 – The modern Ma’rib Dam, as seen from the road across the dam wall. Part of the dam wall can be seen at the lower left of the picture.